The Safford Fifth Avenue pen is almost always found in very poor condition. I find these pens interesting for a couple of reasons. First, it is another line of “Store Pens”. It was once produced for the Woolworth Stores in the US. The name Fifth Avenue, evokes a classy, upscale experience due to its namesake in New York City. A catchy marketing effort by Woolworth, to be sure. Secondly, the imprint on these pens states that the Fifth Avenue pen is made by the Safford Pen Company. Well, this is the Parker Pen Company in disguise. George S (Safford) Parker was the founder of Parker, in Janesville, Wisconsin. The use of his middle name distanced Parker from these lower quality pens. Parker produced these pens in the 1930s (along with a pencil) during the depression to keep people working and to generate a working profit, albeit small. The materials were of less quality than the Duofolds of the time. The information that I have picked up on these Fifth Avenue Pens is from a memoir of Mr. Philip Hull, entitled Memories of Forty Nine Years (1934-1983) With the Parker Pen Company. In this publication Mr. Hull indicates that one of his first jobs was working on this pen, so we can place it in the early to mid-thirties. He states that the contract was with F. W. Woolworth Stores. The cost to Woolworth was about 10 cents for the pen in a cardboard box and they retailed at the stores for 20 cents and eventually for near 40 cents. Apparently, Parker took this work on to provide extra jobs during the Depression and employees working on the Fifth Avenue pens agreed to work for lower wages than other Parker workers. Even though they produced a large volume, pay rates were low, and materials used were of low quality, Parker did not generate a profit on these pens, but was able to keep many people working during a very difficult time in our nation’s history. According to Mr. Hull, the plastic parts of these pens were mostly reclaimed plastic (pyralin) used in other Parker pens. The nibs had no tipping material and were made of ordinary, unprotected brass, as were the bands, clips and levers. I am very grateful to have run across this memoir, which sheds some light on a pen that I had seen through the years and had little information about. Here is a picture of a Fifth Avenue pen, after being taken apart. You can see that the brass parts are in quite bad shape. The usual lever fill repairs were performed. I knocked the feed and nib out of the section, cleaned them and removed the sac remnants from the end of the section. The three clean parts were put back together and a sac was attached back to the section with sac cement. The brass clip, lever and cap rings were polished (there was extensive grime) over the course of a couple of days. The exterior was cleaned and polished and a new j-bar was inserted in the barrel. The section was inserted in the barrel and the filling system was tested with water. All works well. The only negative is that the Fifth Avenue nibs on these pens are very rigid and without any tipping material which makes them quite scratchy. I gently smoothed the nib with a very fine grit paper and it writes well. I think the most interesting thing about these pens is pictured below. The ends are “stepped” and I believe that in this model, Parker clearly used Duofold materials at each end of the pen. 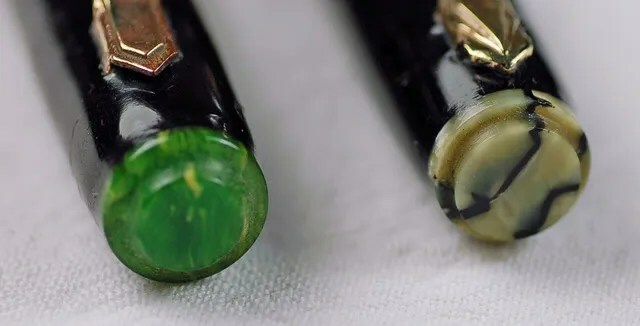 The ends of these two pens are clearly jade and black/pearl materials that appeared in the Duofold lines. I wonder if there are any Fifth Avenues with less common Lapis and Mandarin? All in all, these are very cheap pens, but with a very interesting production story, shedding light on the Great Depression, and a Company dealing with the times. When restored, they will not be the best writers in your collection, but will allow you to tell a tale.